Zenefits Help Center Life & Disability Life Insurance What is Benefits Reduction? Benefits reduction is when the maximum volume amount gradually decreases as an employee ages. 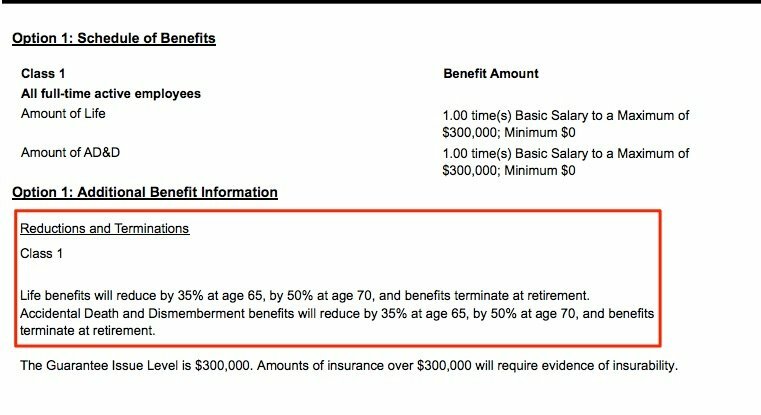 For example, if an employee has elected $100,000 when they were 64, and are now turning 65, they may only be eligible for a maximum of $75,000. Benefits reduction is often indicated as a percentage amount of volume per age range, as seen below. What are the different types of life and AD&D insurance plans in Zenefits? How are life insurance rates calculated? What is a "guaranteed issue" amount? What are some key terms for life insurance and AD&D? How do I add a beneficiary to my life insurance policy? What does "Totally Disabled" mean and why is my coverage delayed because of it?